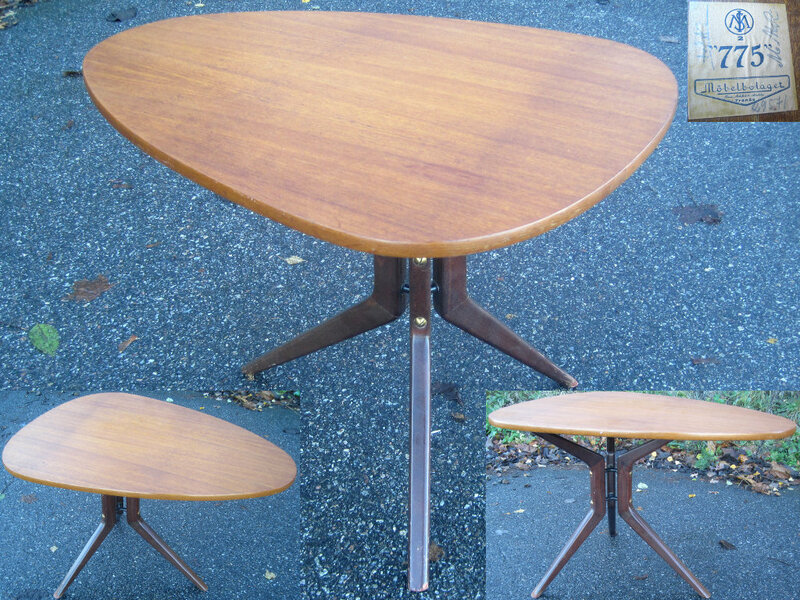 Danskt 60's teak side table or small coffee table with magazine shelf. L=51, W=44, H=50 cm. 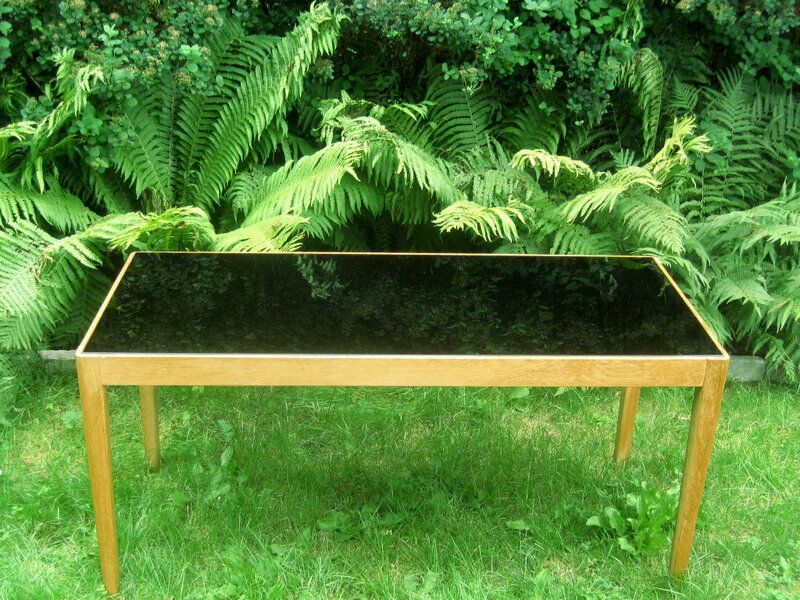 Oak coffee table with black glass table top, also suitable for use as plant stand. L=112, W=52, H=53 cm. 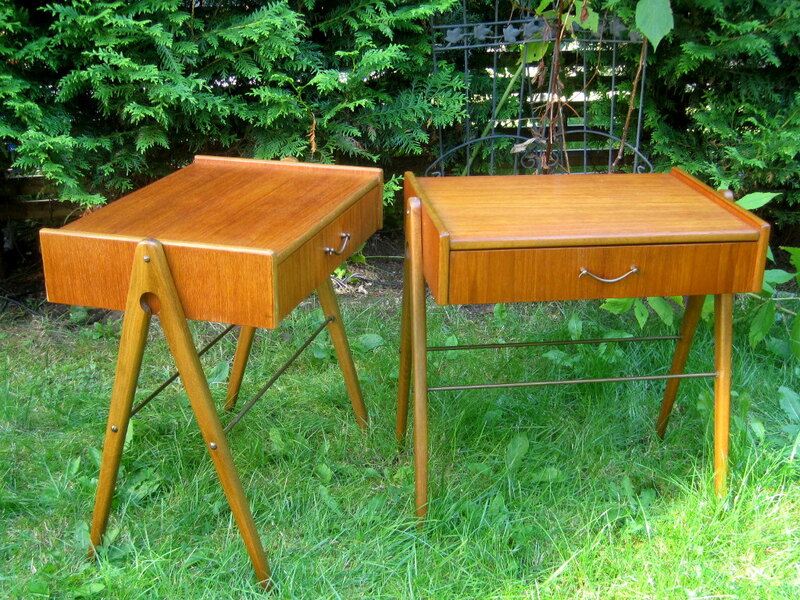 A pair of Swedish 50's or 60's teak bedside tables with drawer. W=46, D=33, H=50 cm. 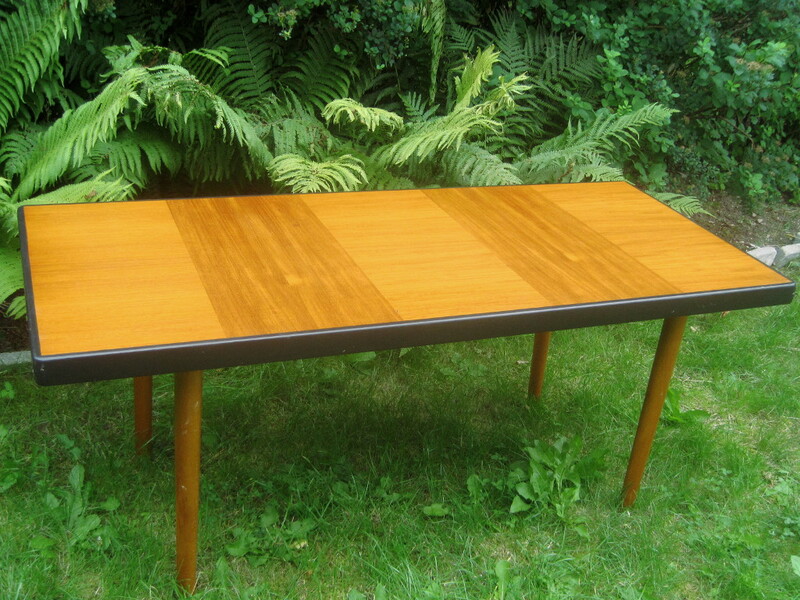 60's teak veneered coffee table with black lacquered edges. Some scratxhes. L=132, W=57,5, H=54,5 cm. 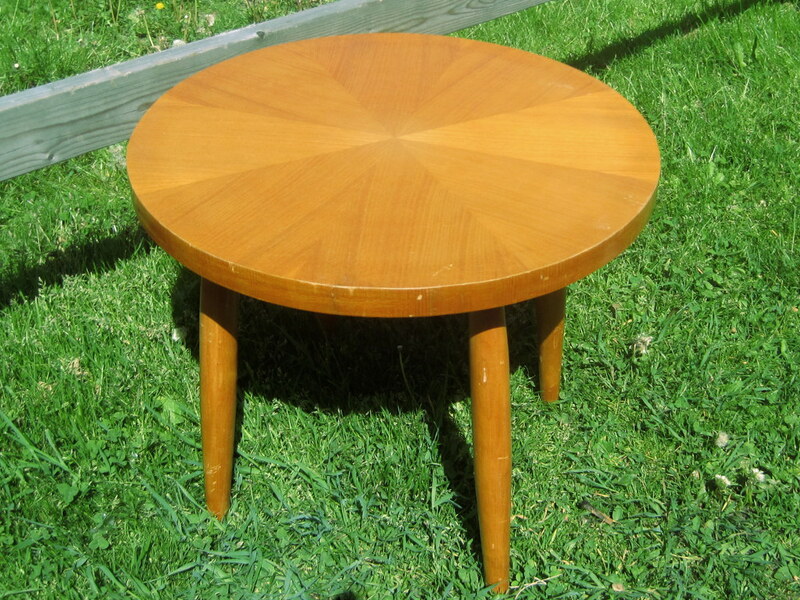 Scandinavian 50's or 60's teak nesting tables on shaker legs, probably made in Denmark. Largest table with a small mark on top and some wear to one of the corners. Largest table: W=55, D=36, H=47,5 cm. 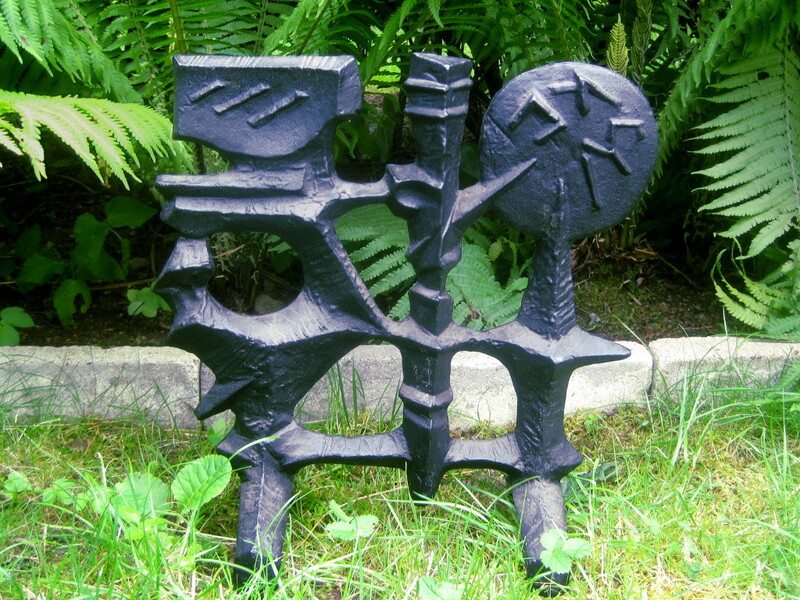 1960's cast iron sculpture by Olle Hermansson, Husqvarna. W=34, H=36 cm. 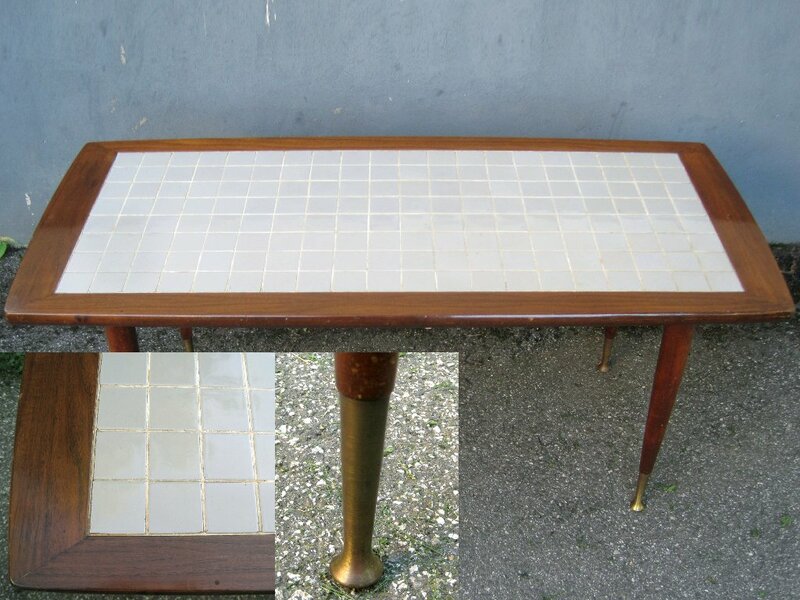 2 400 SEK Swedish 50's or 50's mahogany tainted coffee table with light grey tile mosaic top and tapered legs. L=116, W=51, H=52 cm. 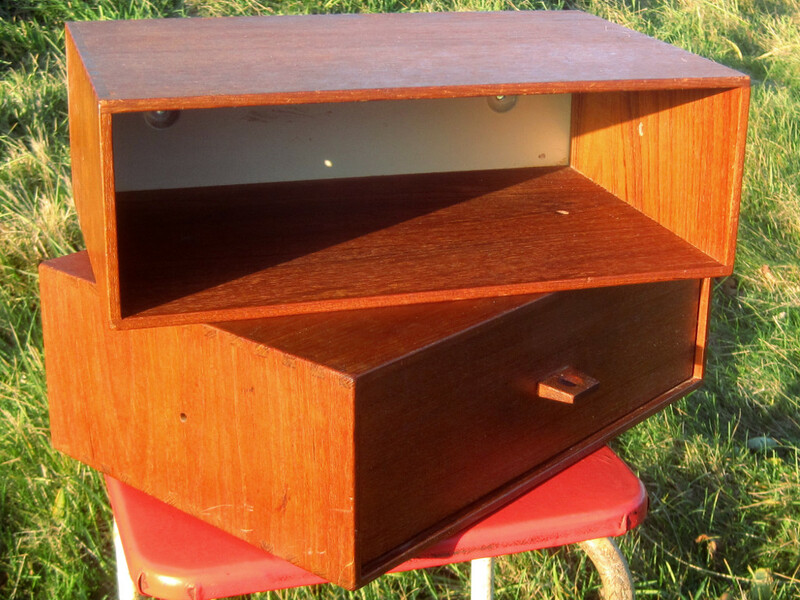 Two wall mounted teak bedside tables, one with a drawer. Probably parts of a larger shelving system (drilled holes to the gables and bottom). W=37,5, D=26, H=12,5 cm. 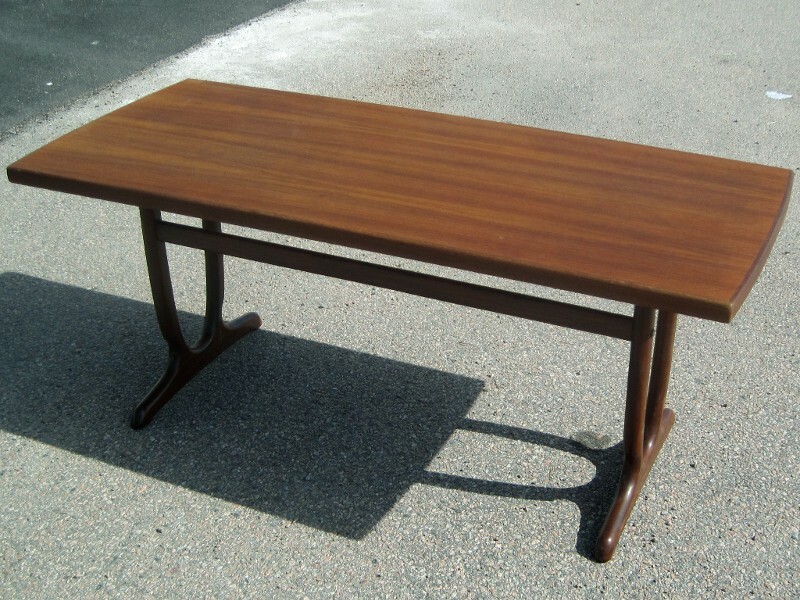 Swedish 50's triangular teak coffee table on three legged base, Möbelbolaget Tranås Möbelfabriks Aktiebolag model no 775. L=80, W=62, H=55 cm. 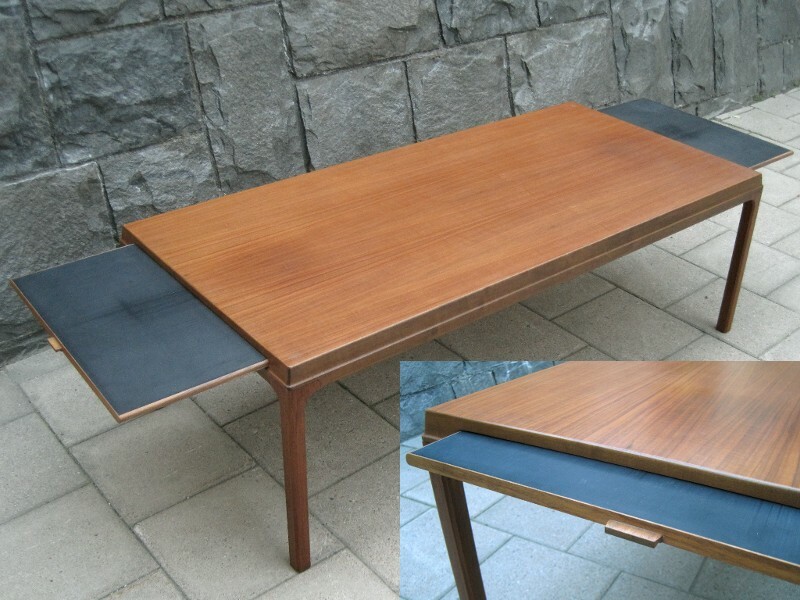 Swedish 50's rare dropside coffee table by FM Förenade Möbler Linköping, probably designed by Svante Skogh. A few marks to the top. H=58, W=55, L=94/128/162 cm. 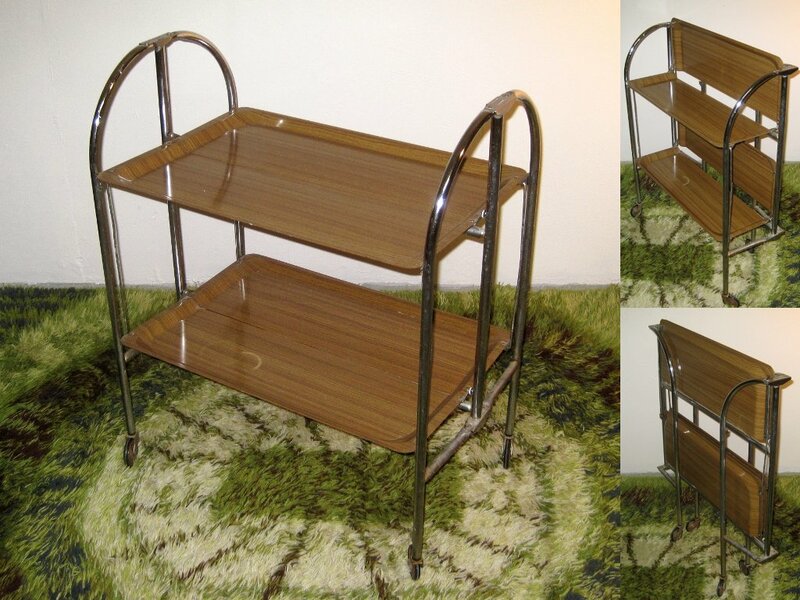 German 60's collapsible serving cart. 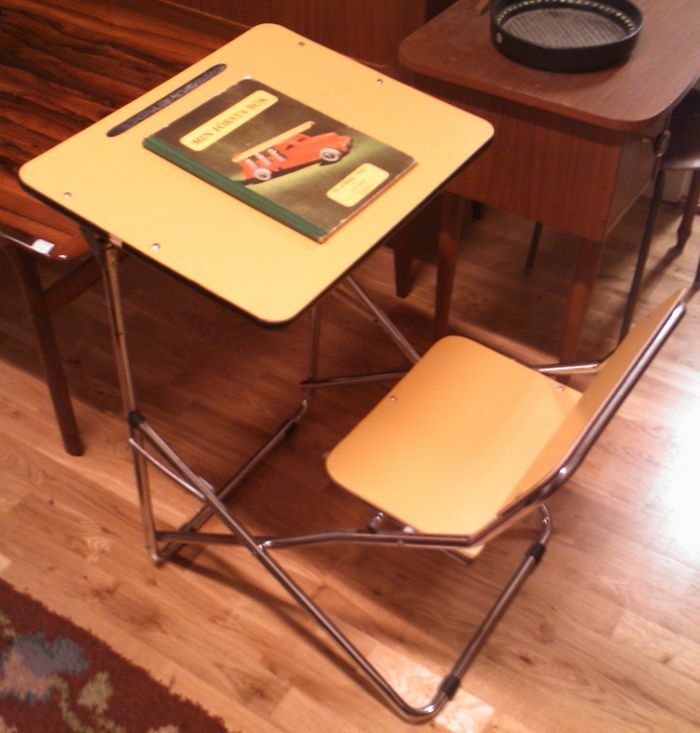 The model was designed and patented by Bremshey & Co 1955, named Dinett. A couple of heat marks on the lower tray as shown on picture. 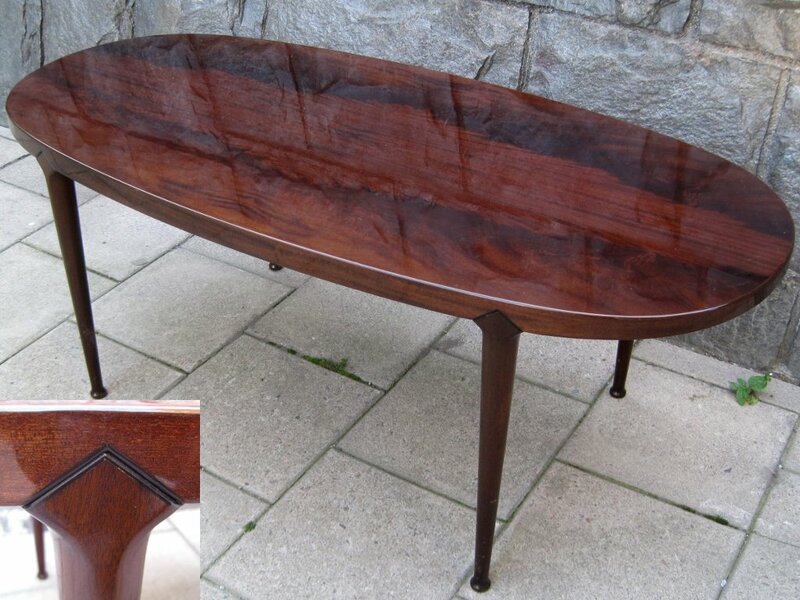 Elegant, oval dark mahogany coffee table with beautifully fitted legs, Norwegian design, manufactured by Aase Möbeldreieri. The glossy lacquer with some scratches. L=138, W=64,5, H=53 cm. 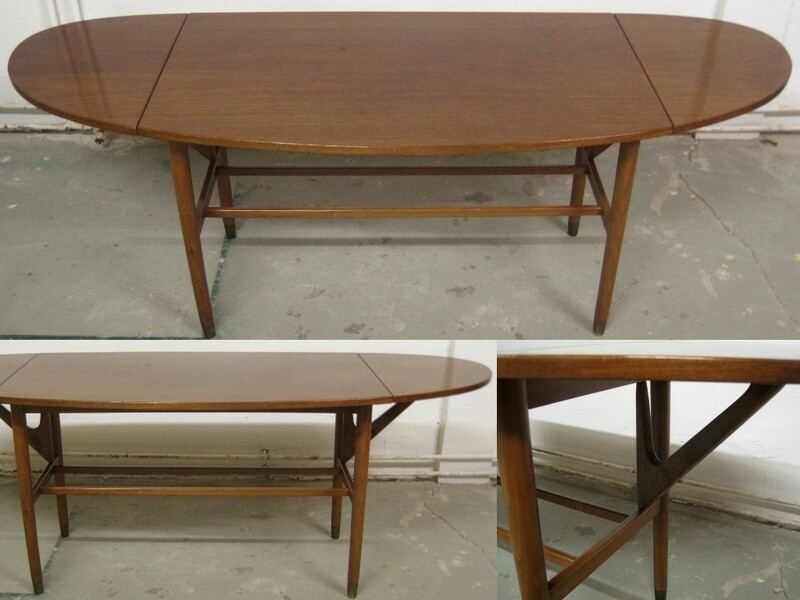 Scandinavian 60's walnut veneer coffee table with black formica leaves. H=54, W=75, L=160 cm+leaves 2x30 cm. 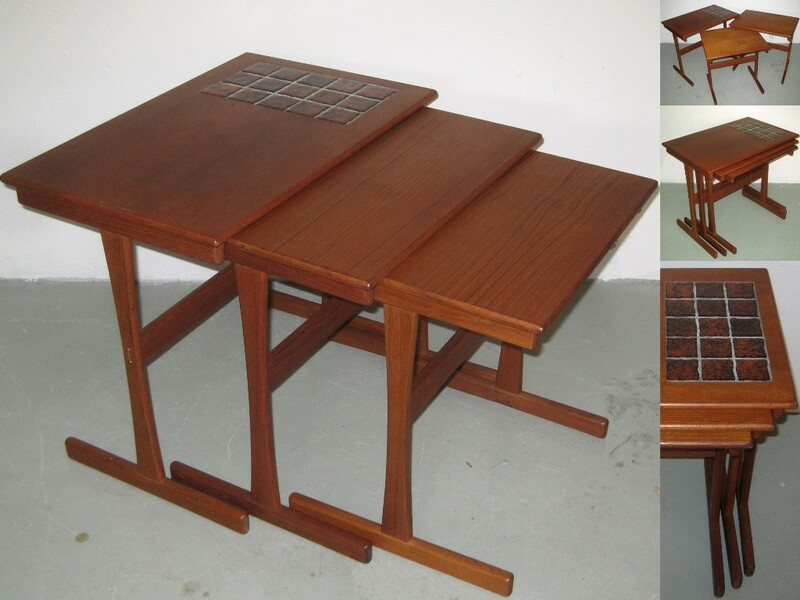 Teak & walnut coffee table. L=140, W=60, H=60 cm. 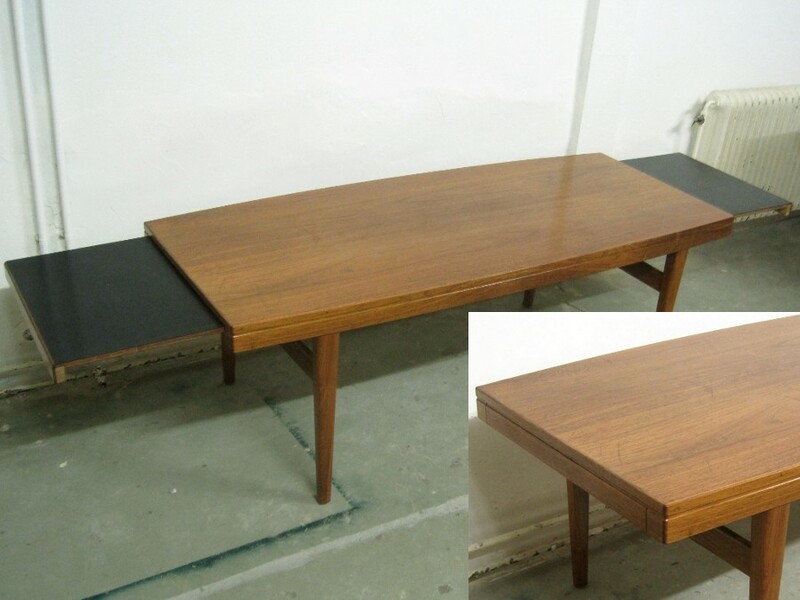 Swedish 60's walnut coffee table with black formica leaves. Some scratches to the top, otherwhise in good condition. Skaraborgs Möbelindustri Tibro. H=56, W=66, L=160 cm+leaves 2x36 cm. 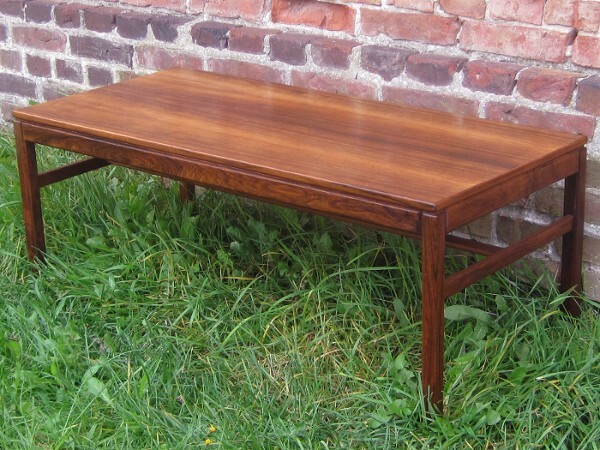 Small coffee table or side table, elm veneer. Some scrathes and wear. D=60, H=51 cm. 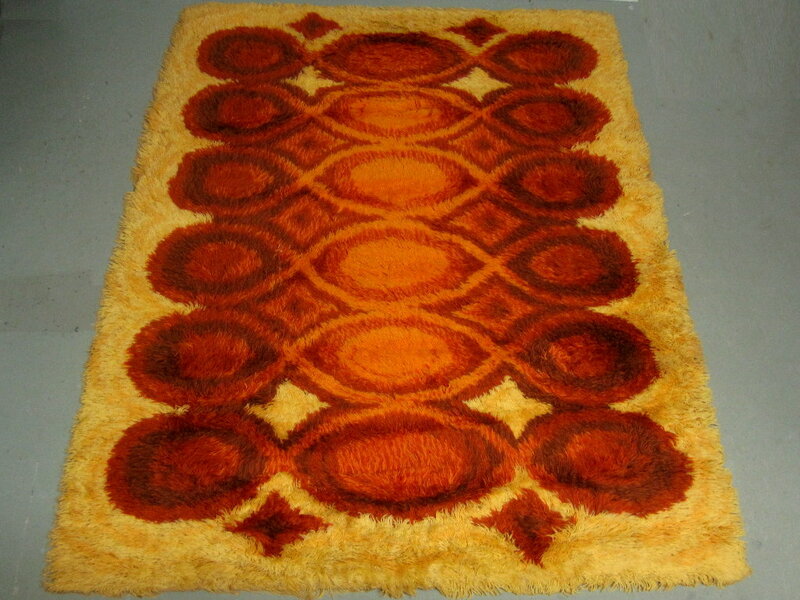 Rug in yellow, orange and brown, 190x140 cm. 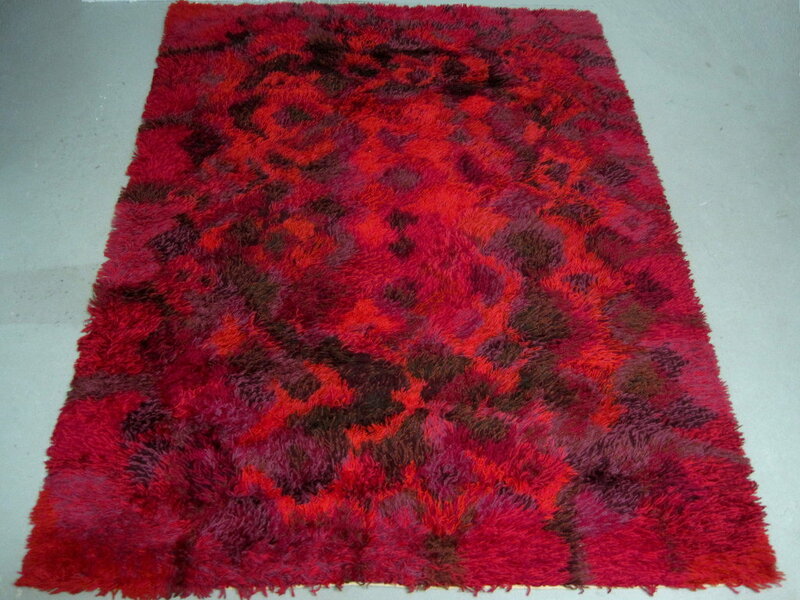 Wahlbecks Melodi-rya Sonat, Swedish 60's wool rug, 190x140 cm. 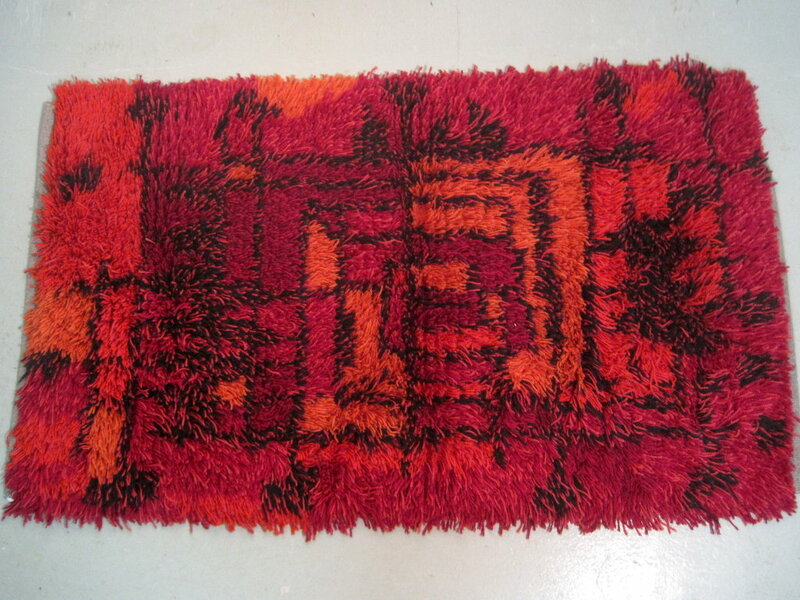 800 SEK Marianne Richter Kolmården, Swedish 60's wool rug. 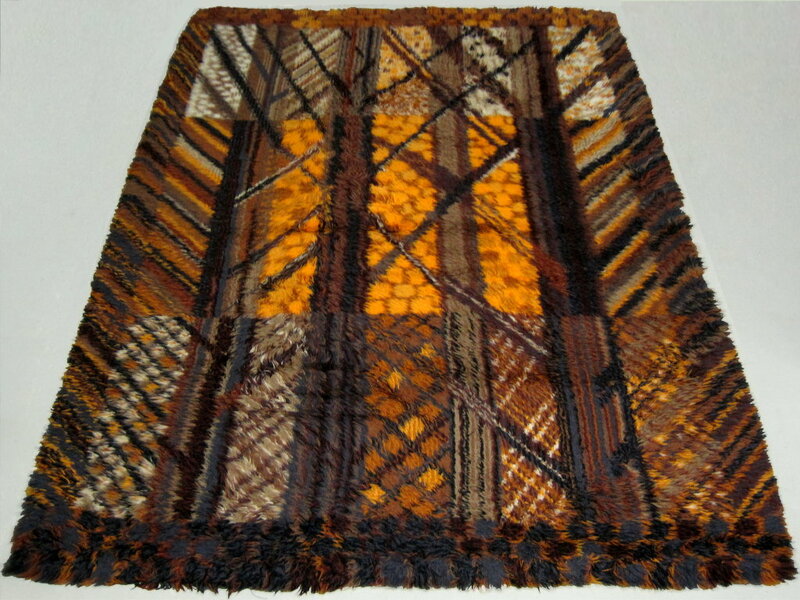 226x165 cm. 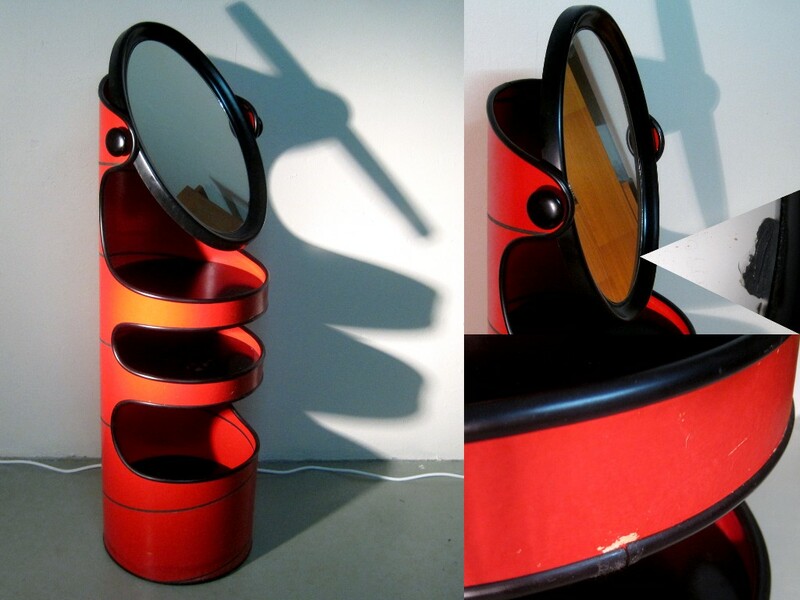 Red tubular paperboard vanity table with plastic shelves and mirror. Some wear and a mark on the mirror close to the frame. Diameter 35, total height 117 cm. 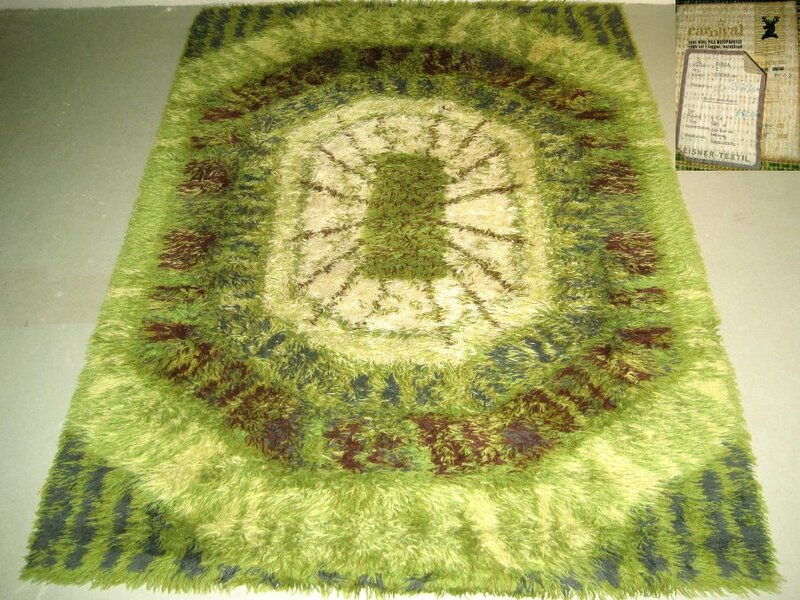 Wool rug by Carnival, England, 198x137 cm. 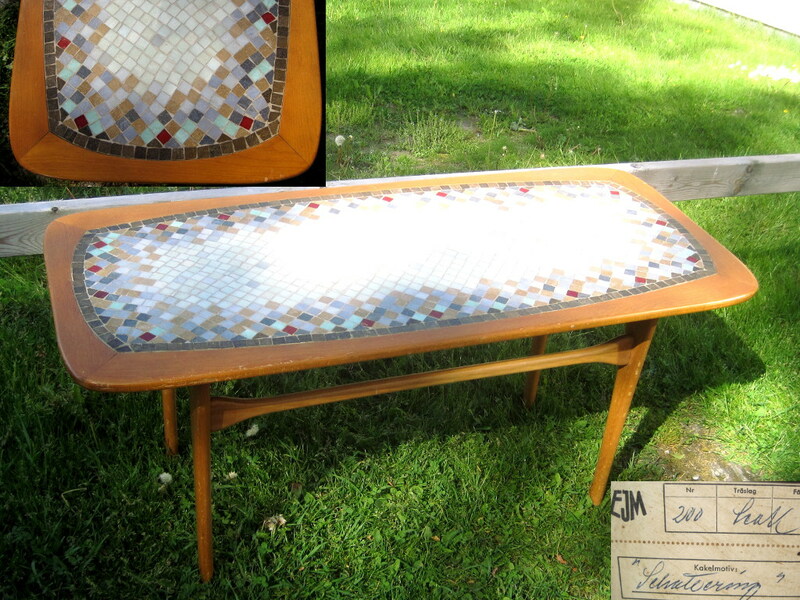 Swedish 60's teak & mosaic coffee table. Some scratches and wear to the wood, mosaic tiles are intact. L=120, W=54, H=56 cm. 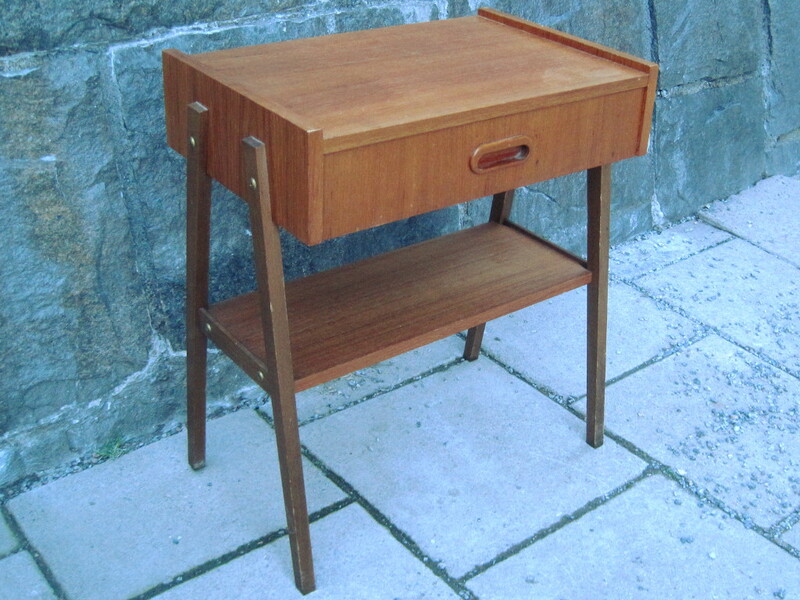 Swedish 60's teak bedside table with drawer and magazine shelf. Some wear to the surface. W=46, D=30, H=53 cm. SOLD! 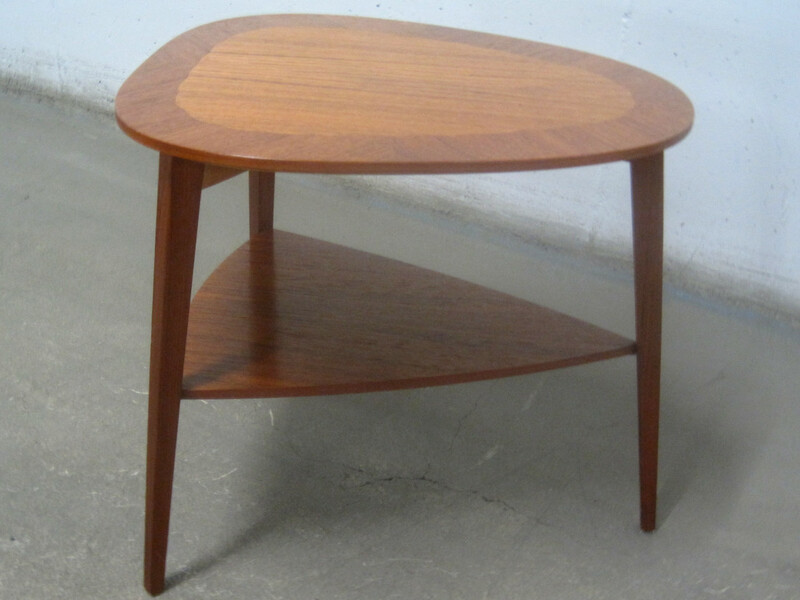 Swedish 60's rosewood occasional table model Casino by Sven Engström & Gunnar Myrstrand, Tingströms, Bra Bohag. L=100, W=45, H=40 cm.